Jungle Red Writers: Jungle Red Writer's: We're Puzzled! CONGRATULATIONS to our Rhys Bowen for being nominated for an Edgar Award for her stand alone mystery IN FARLEIGH FIELD and to our Hallie Ephron for being nominated for a Mary Higgins Clark Award for her suspense novel YOU'LL NEVER KNOW, DEAR!!! We are so proud and pleased to have their talent recognized by the Mystery Writers of America! Well done, ladies!!! SUNDAY FUNDAY! The Jungle Reds have been puzzled. See if you can solve the crossword and if you do, let us know (honor system) and we'll send you a Jungle Red Writers bookmark! 4. Name of Thoft's P.I. Readers, if you get stumped on any of these, feel free to ask us questions in the comments section. We're happy to help or give some hints! For future reference -- what's your favorite sort of puzzle? Jigsaw? 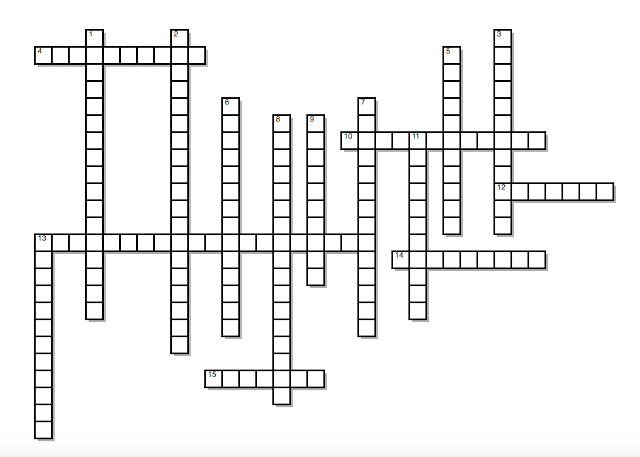 Crossword? Sudoku? Word Search? Congratulations, Rhys and Hallie . . . so well-deserved! I like word searches and crossword puzzles, Jenn, but I'm not a Sudoku fan. Jigsaw puzzles are fun to do with grandbabies . . .
Now I'm going to work on the crossword puzzle . . . .
Joan - I did Sudoku for a while but only the easy ones. I’m more of a word gal. I love word searches. Absolutely love them. Don't do them that often, but that's another story. Okay, solved . . . that was really fun, Jenn! Thanks! Okay, done! That was fun. I try to solve the crossword in the newspaper every day. It takes me all week to do the Sunday one! Daily would be a challenge! Solved! Hint to fellow workers: use punctuation. Congratulations to Rhys and Hallie! And a note to all the folks who give out mystery awards? Save time. Just give these ladies all the prizes now. I love puzzles. I can get lost in a jigsaw, and have even figured out ways to keep the cats from batting all the pieces onto the floor. I work sudokus daily, but I'll have to admit that the Friday and Saturday NYT crosswords often flummox me. I'll do word search, too, if I have the time, but often there's a mystery I'm eager to solve, or at least finish reading . . .
Gigi, yes, cats are not friendly with jigsaw puzzles! King George makes it more of a hide and seek process. LOL! Around Thursday I start to feel out of my league with the NYT crossword, Gigi. Sunday? Forget about it! I think I need to work up to it! Sunday is actually only about as challenging as Wednesday, but there's just a lot more of it. Thursdays can kill me if I can't figure out the trick. And yes, Jenn, there is nearly always one missing piece by the time I finish a jigsaw puzzle. I call it a tradition! Congratulations to both Rhys and Hallie! I have not read Rhys' book as yet, but I just picked it up on audio. I have read Hallie's YOU'LL NEVER KNOW, DEAR - what a great book! Enjoyed it very much! OK, puzzles - don't hate me, but I'm not a big puzzle person. Not sure why. I have so many friends who work jigsaws and crosswords and sudoku, but they are just not my 'cup of tea'. Maybe one day. Nothing wrong with that! There are so many ways to occupy the brain - of course, reading is my number one. I love crosswords. Have made this into a pdf so it prints easily. If anybody wants it, write to me at edith at edithmaxwell dot com. And done. Thanks for the fun! Thanks for sharing the pdf, Edith! That was fun! But I didn't expect to put punctuation marks in the blanks so that threw me off a little. I love all kinds of word puzzles and even some number puzzles - I do Sudoku and Ken-ken every day. I also do jigsaw puzzles and other kinds of manipulative sorts of ones. Is there a special name for them? Ha, when I proofed it, the punctuation threw me so I kept it. Heh heh heh. I’ve never tried Ken-ken - must investigate! Congratulations to Rhys and Hallie! Also done, but did use google. Cheat? moi??? Congratulations to Hallie & Rhys et al. What a talented group you are. I love jigsaw puzzles. Do them online; three cats discourages the real thing. Math skills not strong enough for sudoku. Spelling not good enough for cross words. There is no math in Sudoku. You could use colors, or letters, or dingbats. Numbers are just easier to keep track of. At worst, all you have to do is count from one to nine. Give it a try. It's all just logic. Crosswords -- several a day -- I subscribe to some, have an app on my phone, do the NYTimes and the Wall St. Journal and the LATimes. This was fun! Wow! I’m happy to get the NYT done! Congratulations to Rhys and Hallie. Hi, Dru! I’m really going to have to figure out how to do a word search! Solved and even learned a couple of things. Thanks for assembling this. I enjoy crosswords, jigsaw puzzles, and fairly easy Sudoku puzzles, as well as bridge problems. Not a big fan of word search unless we're playing Boggle. I don't do so many crosswords now that we no longer get the newspaper. Jigsaw puzzle - interactive - online - about the Reds. My brain is humming :) Bridge bewilders me. Someday, I vow to learn it! I'm not a puzzle-doer. The only exception is on a plane. Then I do the crossword in the airline magazine. It's usually dumbed down to my level. My husband does the NY Times crosswords (he times himself). Sudoku - all levels. His go-to method of dealing with insomnia is to do word puzzles in his head. I always do the crossword when flying, too. Side note: I really miss the Shopper’s Mall catalog they used to have - crazy stuff! I miss Sky Mall, too, Jenn! Where else could you get a foot high yeti for your garden? I admit it: flummoxed by the format of this crossword. A creature of habit, those nice square ones make sense to me. A favorite on line puzzle is Jumble Jong that combines jumble words and “reverse scrabble” — the tiles are moved off the board to make words. Seems that when the jumbles are easy to solve, moving the tiles into words is hard and vice versa. Congratulations Rhys Bowen and Hallie Ephron on your book nominations! Jumble Jong - ooh! I am going to look for that one. Thx! Jenn, my go to site for Jumble Jong is fborfw.com, the website of Lynn Johnston’s For Better or For Worse comic strip. Enjoy. This is Jenn’s fabulous brainchild! Amazing amazing! I love crossword puzzles—it’s so gratifying to do the ones that have a theme, I think the Sunday New York Times one is wonderful. When you find the theme, it’s such a triumph. Jenn you are such a joy—and yes, so happy that you put me and 12 across in a puzzle! Thanks, Hank! I am very in touch with my inner child :) And, yes, I love the themed ones the best! Done. Thanks for the fun morning mental exercise. I love crosswords, but not every day. I'll take spells and do them for a couple of weeks and then abandon them again. I used to enjoy Words With Friends, since it's so similar to Scrabble, but its arbitrary dismissal of real words irritated me no end. The program's vocabulary, at least when I was playing, was too limited. Maybe because it was not created by an American? I could never figure it out. We used to play Anagrams and Boggle when the kids were little. Steve and I are both writers and readers, and I think it helped the girls build their vocabularies, too. I miss that, but Zak is now old enough--and widely read enough--to start to be a good challenge. He's coming to stay for a few days soon, and we'll have to have a Scrabble tourney. My sister-in-law prints out the NYT Daily Crossword every morning to solve during the day. But it takes an additional subscription: $4.99 extra month, on top of the monthly fee for the online site. I have a friend who used to evaluate her dates by whether they could hold their own in Scrabble or not. LOL - I’d forgotten that! She is a smart cookie (librarian) and ended up marrying a scientist. They bonded over their mutual love of Earth science. Ha! I have a friend who used to evaluate her dates by whether they could hold their own in Scrabble or not. She’s a smart cookie (librarian) and ended up marrying a scientist. Have fun with Zak! We love both Boggle and Bananagrams but I’d rather read than do puzzles. My brain is tired at night from writing! Jenn, I'm pretty sure my husband used Scrabble that way on me when we were dating! Yeah, I used to be so good at Scrabble. (Just ask me.) But HA. When I first played with Jonathan, expecting him to be wowed by my skill, :-) he was SO GOOOD that I gave up. Yikes. Thank you, everyone. I'm still in shock! I'm also not usually a puzzle person unless I'm trying to kill time. I really don't know why. They are excellent time killers, for sure. I think my favorite type of puzzle alternates between crossword and word search. Growing up I used to do the crossword in the back of the TV Guide every week. Nowadays I do the one in the back of Mystery Scene each time it comes out. I should note that I don't always complete it because it seems I'm not as smart as whomever makes these puzzles up. But I give it a good effort each time out. I like the word search puzzles as well though I do them less often. By the way, congrats to both Hallie and Rhys! Also, my local paper publishes a series of articles at the end of / beginning of each year about people's reading lists in the area. The author, Lauren Daley, has the Century Club, the Half Century Club and the Quarter Century Club. This year, for the first time, I made the Half Century one. I was mentioned in today's article including my love of Ingrid Thoft's Duplicity. That’s wonderful, Jay! Ingrid’s Duplicity is top notch! Oh I know. I've been talking the book up for a year straight now to anyone who would listen. (and likely a few who didn't want to listen too). Thanks, Jay! My publisher should put you on retainer; you've been such a champion of DUPLICITY! Thanks for playing, everyone! If you want some JRW swag, send your address to jennmck at yahoo dot com. Yeah, I know you’re not supposed to use punctuation but I’ve always had a certain disregard for the rules. ¯\_(ツ)_/¯ I like to think it liberates my writing. ;-) And clearly, I am a puzzle person - NYT every Sunday! - since making crosswords has been my new time waster. This one shows up small on the phone - much better on the laptop. Next up I need to create some Jungle Red brain teasers or maybe take a sedative. LOL! Jenn, you are brilliant! We salute you! I love sharing the crossword with the Hub - between us, it is much easier. That's what we do, too, Jenn. We put it on a clipboard. I do as much as I can and hand it off to him. He repeats and hands it back to me. We usually get it in two round trips! Congratulations Hallie and Rhys, and bonne chance. Personally I think you both are shoo-ins. We do the NYT puzzle every week. I've always done crosswords, but Julie hadn't until maybe 20 years ago. We were on Key West with a group of friends, staying at Duval House (waving at Lucy Roberta), and it was the Sunday that the search was on for John John's place. We were all arranged around the pool with pitchers of mimosas. I remember the puzzle theme was "key", so appropriate for the venue. This was when I found it was more fun to provide the answers without looking at the paper, and this is the way we do the puzzle until this day. Julie works it and asks me each time she gets stumped. She is very good at working out the theme, too. We've been known to take it with us for appointments, working it while we wait. My ortho PA is fascinated by this, and she loves trying to find an answer that has the two of us clueless. We play well in groups! Groups does make it go faster. Also, when stumped I've noticed if I walk away and come back later the answer pops into my head. Love that. I love crossword puzzles . I do them on road trips (while my husband is driving!) This one was fun and not too hard. I admit I had to look up a couple of answers but finally got them all. Thanks. So excited for Hallie and Rhys. Loved, loved the books. I also like Sudoku and jigsaws. I love puzzles, especially crossword and jigsaw. But I have to do the jigsaw puzzles in an app on the iPad because my cat firmly believes that anything on a flat surface that is push-able belongs on the floor -- puzzle pieces are far too tempting. What is your secret, Gigi? I put a blanket or a towel over the table when I'm not working the puzzle. And sometimes stack books or other things on top of the blanket. The cats have nothing to bat around. Of course, I still have to be vigilant when I am working the puzzle because anything the cats bat off, the dogs will eat. Oh, goodness, I hadn't even considered the whole dog element. All you need is big bird to swoop in, Gigi. When I'm not reading, I work crossword puzzles, but it's hard to find the more difficult puzzles; I'm always looking for the book that has the biggie ... the 2-3hour puzzle. 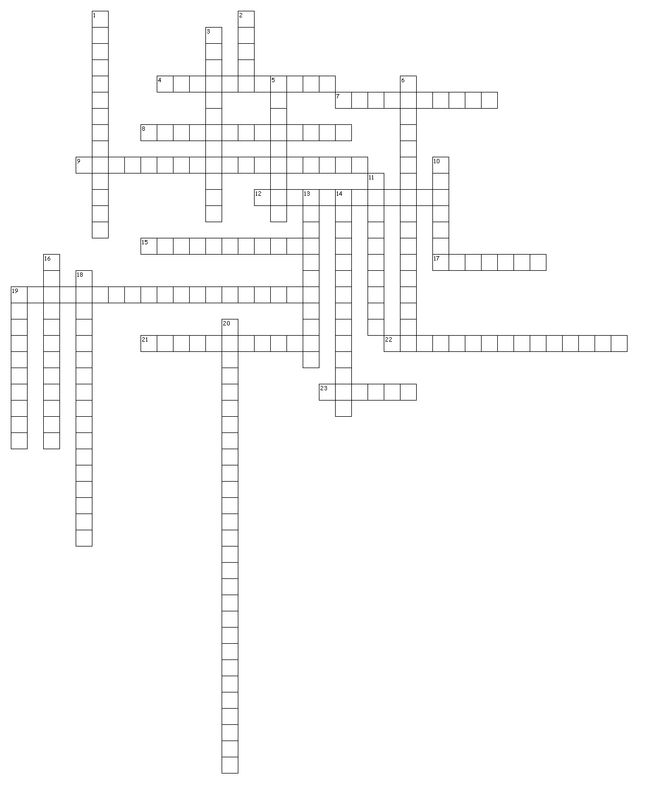 Online, I sometimes do Babble, which is wordsearch, with a 5×5grid. Do you play 'what's in a name'? write your name (or a phrase, a booktitle), on the paper, see how many words you can find ... we played it as children, 70+years ago. What's in a name - we should totally do that on JRW. Thanks so much for the idea, Christine! Congratulations to Rhys and Hallie! Well deserved to you both. Alas, the crossword solutions eluded me - but I'm sure many others aced the puzzle. You'r making me feel very NYT crossword worthy, Kait. Thank you. There has to be some degree of difficulty, right? so glad I stopped by this morning. Congratulations to Rhys and Hallie! Now I enjoy crossword puzzles when I get a chance to spend time doing that. Though you will find me reading a book instead. Yes, books always win for me, too. Love books. Reading a new book now. I discovered a new series for kids called Sisters Grimm. I'm a crossword gal all the way. One of my favorite ways to fall asleep is settling in with the New York Times Sunday crossword puzzle. Every other year one of the kids will get the book compilation as a Mother's Day present for me. Compilations are the best, Julia. And, yes, they're great for knocking out an overexcited brain. I stayed up late, got up late, and then worked on book reviews. So, I'm now catching up on Jungle Reds and then FB. I will do the puzzle tonight when I have a bit more time. I enjoy crossword puzzles, but I am also easily frustrated by them. Word searches are a bit more relaxing. I do love a good jigsaw puzzle, but I rarely do one. However, for Christmas, I bought myself a jigsaw puzzle of a bookstore and plan on putting it together sometime soon. It's so satisfying to make the pieces fit. And, I'd like to once again congratulate Rhys and Hallie! Two of my favorite authors and people and two of my favorite books!